There is a wide range of apple rootstocks in Australia. These rootstocks each have a characteristic effect on the scion variety growing on top. Seedling rootstocks (for example, Granny Smith open pollinated seedlings), although used for the rootstock, are variable in growth and are more susceptible to stress conditions, such as the effects of drought on fruit size. They are also very mildew susceptible. Most of the rootstocks now used are clonal and have to be propagated vegetatively, by means of cuttings, in stool beds or layer beds. Each particular rootstock affects the tree vigour and final tree size. The development of fruiting of the scion variety is also affected, as those grafted to dwarfing rootstocks tend to be more precocious. Scion fruit quality can be affected (maturity hastened or delayed, fruit size enhanced, colour improved); however, this may be because of the tree size and foliage canopy density. Some rootstocks are more resistant or susceptible to certain pests or diseases. All rootstocks described here are different varieties of apple (Malus domestica Borkh. ), and can be recognised by their variety characteristics. Some newer rootstocks bred for disease and pest resistance have used other species of Malus, but they are not yet commercially available in Australia. This Agfact describes the major rootstocks in Australia and their uses, including some new and only recently available rootstocks. Merton 779 R R ? Carlson, R. F. (1981), ‘The Mark Apple Rootstock’, Fruit Varieties Journal 35(2): pp. 78–9. Cummins, J. N. & Aldwinkle, H. S. (1982), ‘New and Forthcoming Apple Rootstocks’, Fruit Varieties Journal 36(3): pp. 66–73. Ferree, D. C. (1987), ‘In Search of the Perfect Rootstock’, American Fruit Grower, 107(2): pp. 38–40. Masseron, A. (1989), ‘Les Porte-greffe Pommier, Poirier et Nashi’, Ctifl, France. Ministry of Agriculture, Fisheries and Food (1956), ‘Fruit Tree Raising’, Bulletin No. 135, London. Rom, R. C. & Carlson, R. F. (1987), Rootstocks for Fruit Crops, John Wiley & Sons, New York. 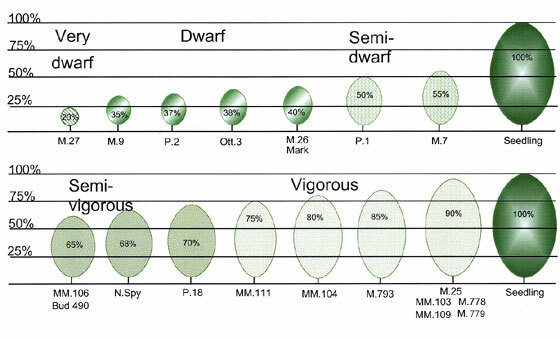 Simons, R. K. (1986), ‘Leaf Characteristics of Apple Dwarfing Rootstocks’, Fruit Varieties Journal 40(3): pp. 71–9. Tustin, S. (1986), ‘Apple Clonal Rootstocks—the Next Generation’, Orchardist of New Zealand 59(1): pp. 16–17.